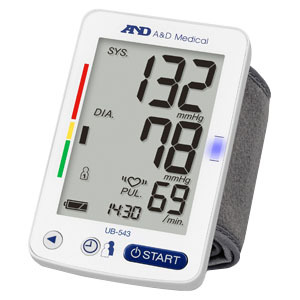 A&D Medical has applied its state-of-the-art measurement technology to the UB-543 Wrist Blood Pressure Monitor that can be used on the wrist with the push of a single button. The design of this premium wrist monitor offers one of the largest screen displays available, while being compact enough for travel. Dual user, 60 memory each. Clock display with time and date stamp. Upgraded model with the new function of "Correct Position Guidance" and an upgraded memory for 2 person use (60 x 2).